Eurocom Corporation (www.eurocom.com) a leading developer of long lifespan, fully upgradable notebooks, high performance mobile workstations, All-in-One desktops and mobile servers as well as a leading provider of embedded video graphics processors, is announcing today that it is now offering Wireless Network Adapters to its offerings to resellers, VARs, dealers and to end users as an upgrade option. In addition to offering the Killer Wireless-N 1102 adapter by Bigfoot Networks in Eurocom notebooks, Eurocom is also offering the adapter to dealers and resellers looking to offer the highest performing wireless card to customers. Eurocom also offers the adapter as an upgrade option to users looking to upgrade their existing system. Eurocom systems are built with the philosophy of upgradeability and configurability. Eurocom offers up to 17 processors, 11 GPUs, 21 storage drives and 5 wireless adapters as options in Eurocom notebooks as configuration and upgrade choices. “On top of our Mobile Workstation, Mobile Server and Performance Business and Gaming Notebook sales to end users, Eurocom has many years of experience serving embedded developers, VARs, Dealers and resellers. As well as upgrading the major makes and models of users notebooks. We expect a great deal of interest in Killer Wireless-N 1102 high-performance wireless networking adapters among our partners and those interested in the best available technology” said Mark Bialic, President of Eurocom. Killer Wireless-N 1102 high-performance wireless networking adapters have Bigfoot Networks’ exclusive Killer Wireless Technology, combining intelligence and control along with up to five times lower latency than competitive wireless adapters. The Killer Wireless-N family includes Advanced Stream Detect™ technology to automatically classify and prioritize latency-sensitive network traffic for online games, HD video and high-quality audio to maximize your online experience. 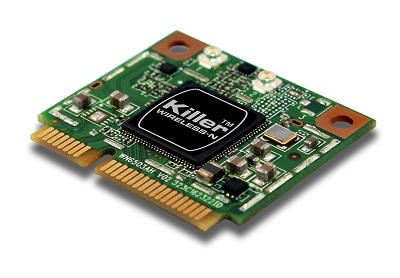 Killer Wireless-N 1102 adapters support dual bands (2.4 GHz and 5GHz), 2-stream MIMO and IEEE standards-based 802.11a/b/g/n in a half-size mini-PCIe form factor. Killer Wireless-N 1102 adapters support industry-leading data rates up to 300Mbps[i] with range-enhancing 802.11n technologies to deliver higher data throughput rates over longer distances. Killer Wireless-N adapters also offer reduced power consumption and Wi-Fi Direct™ technology to ensure maximum flexibility for your mobile lifestyle. • Speed - Killer Wireless-N 1102 high-performance wireless networking adapters are designed for blazing fast performance, up to five times lower latency than the competition. Faster downloads, smoother online gaming and better streaming video are now possible with advanced 802.11n technologies and exclusive Killer™ networking features. • Intelligence - Killer Wireless-N uses exclusive Advanced Stream Detect™ to automatically classify and prioritize latency-sensitive network traffic for online games, HD video and high quality audio for better quality and fewer interruptions in your online experience. • Maximum Control - See which applications are hogging your wireless bandwidth. Set limits using Visual Bandwidth Control™ or shut them down completely with Application Blocking, so they don’t interfere with your online games or other multimedia applications. [i] Up to 300 Mbps raw data rate enabled with 802.11n with 2 spatial streams. Actual wireless throughput will vary.